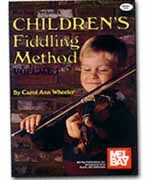 As both a championship fiddler and superb teacher, Carol Ann Wheeler brings all her talents to bear in this fiddling book written especially for young children. Students raised in the Suzuki tradition will immediately take to the method, concepts, and techniques used in this book and listening tape. Common folk songs familiar to the student are used to demonstrate and teach the basic skill of oldtime fiddle playing. All melodies are first presented in their simplest form followed by more complex variations with introductions, ornaments, and endings. Students of all levels will find challenging material in this book. Younger students can proceed at their own pace, returning to the more difficult variations at a future time.